Paris Climate Agreement: Success Or Failure? : 13.7: Cosmos And Culture While the new climate accord does not go far enough, is a first step in developing a new set of behaviors for human civilization — toward our evolution as a true planetary species, says Adam Frank. Paris Climate Agreement: Success Or Failure? 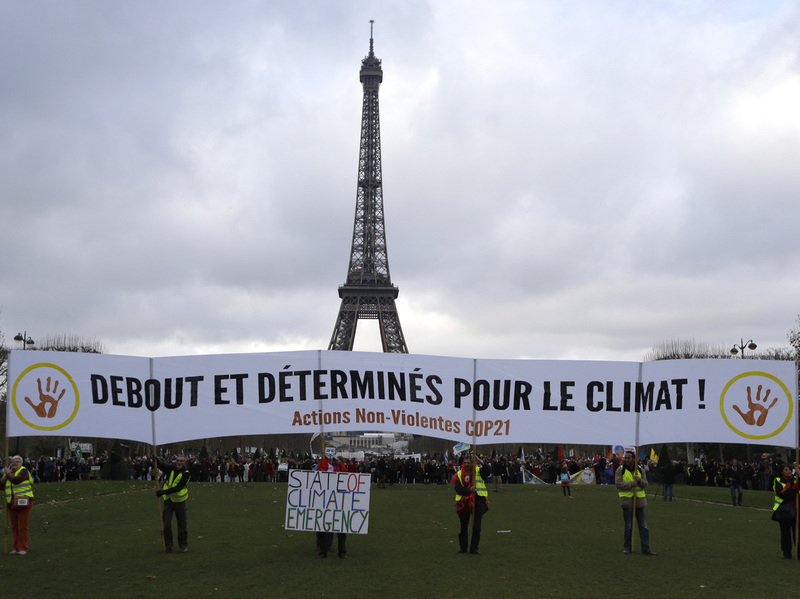 Activists hold a banner reading "standing and decided for climate" during a demonstration near the Eiffel Tower in Paris on Dec. 12, 2015, during the United Nations Climate Change Conference. Politics and science are two very different beasts. Science, at its best, tries to extract some measure of truth about the world from a combination of observation and theory. Politics, even at its best, may be more concerned with perception than truth, using the former as a means to advance policy goals. So, what happens when the two collide in addressing a possibly existential threat to global civilization? This is the question lying like a shadow over broader discussions about last month's Paris climate conference and the agreement it produced. With this in mind, was the accord signed in Paris a milestone in the battle against climate change, or was it much ado about too-little — and too-late? It was only after a marathon of hard negotiating that almost 200 nations agreed to reduce greenhouse gases to levels yielding no more than 1.5 to 2.0 degrees of warming. Scientists are convinced that anything above the 2 degree mark locks in changes to the planetary climate beyond civilization's adaptive capacity. As soon as it was announced, the agreement was hailed by many as a breakthrough. The Guardian, a newspaper that's taken climate coverage very seriously, hailed it as "The Worlds Greatest Diplomatic Success." In The New York Times, Thomas Friedman called it a "big big deal." The Washington Post called it "historic." "What people wanted to hear was that an agreement had been reached on climate change that would save the world while leaving lifestyles and aspirations unchanged. The solution it proposes is not to agree on an urgent mechanism to ensure immediate cuts in emissions, but to kick the can down the road." The answer, I hope, tilts toward the optimists but for reasons that go beyond their optimism. Without doubt, the Paris agreement alone will barely get human society started on the road to dealing with climate change. The targets are too weak and the governance too uncertain. In that way, the critics are correct in their worries that the mere appearance of the agreement can lead to the perception that the problem has been solved. But, as I've been arguing here for some time, the climate change problem is about a whole lot more than climate change. It is actually humanity's coming of age on a planetary scale. I've recently been doing research exploring how the alteration of climate (along with aspects of "coupled planetary systems") is likely to be the generic response of a planet to the development of an energy-intensive civilization. Feedbacks of the kind we are driving may be inevitable. Thus a civilization's ability to recognize its planetary feedback — and take corrective action — will determine whether or not its history continues, or if it ends up on the cosmic roster of losers. But that implies the response to climate change will be evolutionary. It will mean that planet-scale civilizations, like ours, will likely need to learn new behaviors. For example, the collective response required for a civilization to deal with its climate change might entail cooperation over length and time-scales far longer than anything attempted before. That means new patterns of organization will have to be evolved to the point that they become standard. Depending on the details of their own histories (biological, social and technological) this will be easier for some than others. You can, for example, imagine a civilization composed of very long-lived individuals for whom 500-year plans pose little conceptual difficulty. The most important reality is that the collective behavioral toolbox a civilization is born with may not be up to the job once that civilization advances to the point where it can alter the world that gave it birth. So, as the saying goes, evolve or die. And that brings us back to Paris. While the new climate accord does not go far enough, was a first step in developing a new set of behaviors for human civilization. It was the first step, hopefully, into our evolution as a true planetary species. It's important to also understand that through science, human civilization was forced to build up precedents for these changes over the last 100 years. During the late 19th and early 20th centuries, telegraph and radio allowed people to bridge space and time creating the "beta" version of a global, synchronized society. To make that work, international accords on time standards (among other things) had to be hammered out with great difficulty. And when it comes to climate, the famous Montreal protocol that banned the chemicals destroying the Earth's protective ozone layer was signed back in 1987. So we can evolve. We can develop new ways of collectively living on a planet that sustains both its vital functions and our civilization. But the journey has only started — and it's far from certain that we won't be pulled back by our own, now useless, behaviors from earlier epochs. But maybe, just maybe, we can pull it off and join the roster of cosmic winners. That, more than anything, is why Paris was a big deal.